I recently finished a book that I just had to share with you. If you are a mom, a daughter, or better yet a mom with a daughter, this book is for you! I could see myself in the pages of this story, and I think you will too. 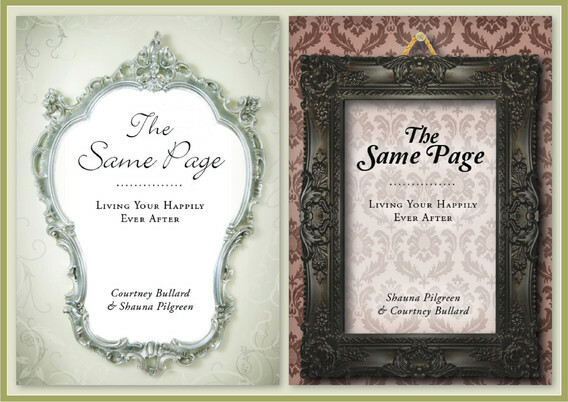 The Same Page, written by Courtney Bullard and Shauna Pilgreen, is a fairy tale flip book that takes place back in the era of castles and formal balls and beautiful dresses. I loved getting lost in the storyline of Adela & Ysebel, the mother and daughter who each tell the story from their own point of view. It was my go-to book for a mental break when I needed to check out of my reality for a few minutes and jump into someone else's. Without giving away too much, this is a story of a mother and daughter who are struggling to understand each other. Reading the story from both people's perspectives is really helpful in considering what the other person must be feeling or thinking. It exposes the "why" behind the outward behavior. As moms, we can get so focused on the external behavior that we often miss the heart of our child. We forget to probe deeper to understand more fully what's motivating the behavior, and in the process can deeply wound our kids and teach them to retreat inside themselves instead of coming to us to talk through what's going on in their hearts. This book gave me a renewed commitment to listen to heart of my kids. The other key lesson that I learned from this book was in regards to pursuing my own dreams. Motherhood requires a lot of self-sacrifice and service to others. Most days, my whole life revolves around meeting other people's needs. And at the end of the day, no one is giving me high-fives for folding the laundry or doing back flips because I scrubbed a couple toilets or sending me a bonus check for preparing and cleaning up from three meals that day. And you know what? I'm okay with that. I'm learning to embrace my role as a mom and (most days) I'm incredibly grateful for the privilege of getting to stay home with my kiddos. But in the midst of getting life accomplished, it's easy to lose yourself. It's so easy to invest all of my energy and time into helping my husband and children accomplish their goals that I forget that once upon a time I had goals of my own. Goals. Dreams. An identity apart from anyone else. As a mom, it's often easier just to shelf our own goals because it seems like a bad time to pursue them. And we can tell ourselves that we're honoring God by dying to ourselves and putting other people's goals and interests above our own. But really what we're doing is just dying. A piece of us (a beautiful piece that God uniquely created in us) lies dormant, but it was meant to thrive. This book reminded me that I need to rummage through the closets in my heart where I stored some goals for a more convenient time, dust off the cobwebs, and start to dream again. The reality is that I do my family a huge a favor when I am fully alive. I give my kids a gift by showing them what it looks like to fully embrace the dreams God puts in our hearts. My family does not need a domestic servant. They need a mom who loves life, loves them, and is living her happily ever after. That is what "The Same Page" stirred up in my heart. I hope you will order it today and allow God to breathe some fresh life into your heart, too. Click here or here to order one today.